An ancient citadel located in the city of Athens, the Acropolis is perched on a high rocky outcrop and contains the remains of numerous ancient buildings of great historical and architectural significance. The name is derived from the Greek Akro, meaning high or extreme and Polis, meaning city. It has a surface area of about 3 hectares. For all of us who love History, and know History, Macedonia is as Greek as the Acropolis. The Acropolis of Athens is the embodiment of the western idea of art, beauty, and democracy. What Is The Acropolis And What Was It Used For? Is The Acropolis Wheelchair Accesible? How Did The Acropolis Get Destroyed Or Ruined? Home to Parthenon, one of the most famous buildings in the world, the Acropolis was built for the goddess Athena. It was once decorated with beautiful works of art which represent the achievements of famous Greek artists. It was also home to a multitude of sculptures and other temple sanctuaries and it provides an excellent example of Doric and Ionic styles of architecture. The Acropolis was an ancient city that still has much of its original Classical architecture and temples. The Parthenon is not the Acropolis itself, but part of it. It is the scared temple of the goddess Athena and is a marvel which everyone must behold. The Acropolis has numerous important buildings, but the Parthenon is the most popular. The other buildings are the Temple of Athena Nike, the Erechtheion, the Theatre of Dionysus, the Propylae, and the Odeon of Herodes Atticus. The Temple of Athena Nike was built in 420 B.C. and it was the very first in Athens to have a fully Ionic order form. 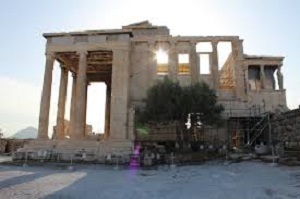 It has been dismantled and some of its friezes are not on display in the Acropolis Museum. Construction on the Propylae began in 437 B.C. but it was stopped after just five years even though it was not completed yet. 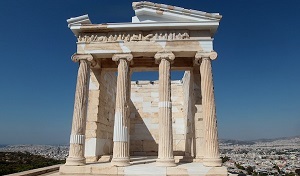 It is made of structural iron and Pentelic marble and its columns reflects the proportion of the Parthenon's columns. The Acropolis is more than 2,460 years old and several history books record its beginning in 447 B.C. Throughout its lifetime, the Parthenon has been a mosque, a temple, and a church. During the war for Athens between the Turks and the Venetians in the 1600's, the Parthenon was blown up. It cost the equivalent of almost 500 war ships to build the Parthenon because the columns are made of marble and the base is made of limestone. 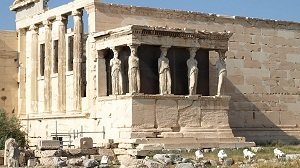 The Parthenon was built for the Greek goddess Athena and each side has hand carved statues depicting a story. One side shows Athena at birth, Athena fighting Poseidon for Athens, Greeks parading for Athena, and another side depicts Greeks and centaurs. Original carvings from the Parthenon are scattered all throughout the world and can be seen in the National Museum of Denmark in Copenhagen, and the British Museum in London, to name a few places. Greece has been trying to get the marbles back for more than a century but have had no success so far. During the Ottoman Period, the Turks took over the Parthenon but it was turned over back to the Greeks in 1822 during the Greek War of Independence. A colossal Athena once resided in the Acropolis. Located inside the Parthenon and known as Athena Parthenos, it stood at almost 40 feet tall and was made from ivory and gold by the sculptor Phidias. The marble used to make up most of the structure is not local. It came from Mount Pentelicus which is 10 miles from the city of Athens. The Parthenon, as well as other buildings in the Acropolis were once colorful. A major restoration started in 1975 and is still ongoing until now. Even if you have been to other world wonders and architectural sights, it is quite difficult not to be awestruck when finally seeing the Acropolis. Greece's most iconic attraction is a wonder to behold and is a must-visit for everyone, even seasoned travelers. A symbol of Athens' former glory, the Acropolis recalls the culture that flourished more than two millennia ago. The Parthenon may be the most popular building, but there are other things to discover in the ancient ruins. Wandering in the grounds will subject your senses to the might and power of the olden Greece and give you the chance to follow in the footsteps of Pericles, Socrates, and Sophocles as they forged their paths and started the building blocks of Western Civilization. Before you enter the ticketed admission area of the Acropolis, visitors have the opportunity to visit the Odeon of Herodes Atticus. 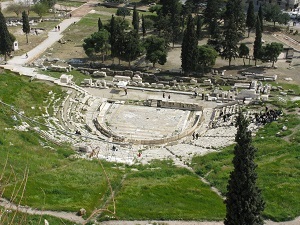 The ancient theatre got its name from Herodes Atticus of Marathon. He built the theatre in memory of his better half, Regilia in AD 161. It was designed with an auditorium fitted into a natural hollow. There are semicircular rows that can seat up to 5,000 people. Between the stage and the auditorium were open passages for the entrance of the choir. Until today, live performances are still held during summertime. 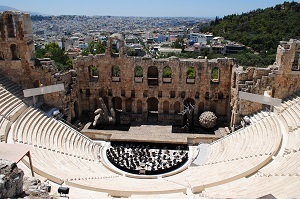 For instance, the Athens & Epidaurus Festival gives people the chance to witness classical Greek opera, as well as other dance and musical performances in the original theatre. After passing through the admission area, visitors enter the Acropolis site through the Beule Gate. This doorway was named after a French archaeologist who discovered it in the 19th century. Now located below the west side of Propylaia, the majestic entrance to the Acropolis. The gates back to 280 BC and was originally linked to the Propylaia through a broad marble staircase that was built during the resign of Emperor Septimus Severus. Only part of the lower section of the staircase has survived. Located beyond the Beule Gate is where tourist come across the Monument of Agrippa. This two-color and tall marble plinth was created in the second century BC for a benefactor living in Athens, most likely King Pergamon. People believed that the monument was named after Marcus Agrippa, Augustus' son-in-law because of the bronze sculptural representation of his four-horse chariot that was mounted on the case in 27 BC. The Acropolis is a glorious symbol of the city of Athens, so it is befitting of a grandiose entrance gate too. The Propylaia is the majestic entranceway for visitors and prepares their senses for the jaw-dropping site that is the Parthenon, as well as the other monumental temples located on top of the hill. Built by Mnesikles during 437 to 432 BC, the Propylaia has a flight of marbles that leads up to a vestibule with five gateways. Located on the west is a deep portico, with a central doorway framed in Ionic columns. There are six Doric columns along the portico which originally supported the pediment. Located on the east side is a smaller impressive portico also with Doric columns. The entrance's sense of grandeur is highlighted by the multifaceted architectural complex which features intricate details. The beautifully preserved Temple of Athena Nike is very elegant, and it has been restored in the 19th and 20th centuries. It stands on a spur of rock on the south side of Propylaia. The statue is dedicated to the Goddess of Athena as the bringer of Victory. Built between the 432 and the 421 BC, the temple features four delicately carved Ionic columns at the south and north ends. Archaeologists believe that the temple's architecture was influenced by the earlier designs of Kallikrates. The balustrade that once adorned the temple is now on display at the Acropolis Museum. 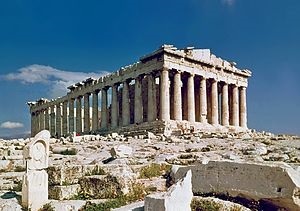 One of the most sacred sites of the ancient world, the Parthenon stands on the highest point of the Acropolis hilltop. Built from 447 to 338 BC during the construction boom, it is a masterpiece by the great sculptor Phidias and the architect Iktinos. The temple venerated the cult of Athena the Virgin, the Goddess of Warfare and Wisdom and the Guardian of Athens. The temple boasts of 136 fluted Doric columns, it has a sense of order and harmony. The columns are slightly bulkier at gradually becomes narrower towards at the top. The interior of the Parthenon is off limits, but tourists have the opportunity to walk around the exterior to admire the structure from all angles. The monument's size alone is awe-inspiring. The east end depicts the Birth of Athena from the head of Zeus while the west end depicts the conflict between Poseidon and Athena for the land of Attica. The temple originally had a roof that was covered with marble tiles with run-offs for rainwater at its four corners. It served as a temple for 900 years and it suffered considerable damage in the fifth century when it became a Christian church dedicated to the Virgin. It was used as a church for 950 years before becoming a mosque in 1456. It was destroyed by a bomb during the fighting between the Turks and Venetians in the 17th century. 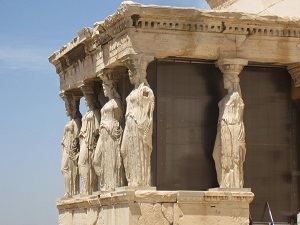 Built from 421 to 395 BC, the Erechtheion has several sanctuaries. The eastern part was occupied by a sanctuary built a century earlier, the Temple of Athena Polias. Located in the western part is the Tomb of Erechtheus and one of the most famous features is the Porch of Caryatids which are six columns sculpted as figures of maidens in place of ordinary columns. 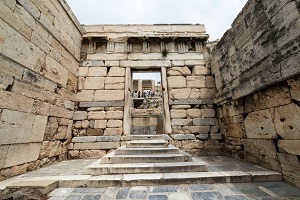 Located under the Porch of Caryatids is the Tomb of Kekrops, the founder of the Athenian royal line. There is a side doorway leading into the adjoining cult precinct of the Pandroseion. Located between the Old Temple of Athena and the Erechtheion, the Olive Tree of Pandroseion is a small temple named after Pandrosos, the daughter of the first king of Athens. It contained the altar of Zeus Herkeios and a shrine to Pandrosos. According to legend, Athena presented the sacred olive tree to the city after her victory over Poseidon in the contest for the land of Attica. The Greek historian Herodotus tells us that a day after the destruction of Acropolis by the Persians, a fresh shoot sprung from the trunk of the burned tree. It became a symbol of the city's survival and as a tribute to the said event, an olive tree was planted on the site in modern times. Opened in 2009, the Acropolis Museum is a must-see attraction and is located below the Acropolis Hills. The museum contains one of the city's most valuable collections of ancient art. The front of the museum has an archaeological workshop where tourists can see archaeologists in action. Illuminated by natural light, the massive exhibition galleries boast of more than 4,000 priceless objects and most of the items were discovered at the Acropolis site. Located near the Acropolis Museum, the Theater of Dionysus has a separate ticketed entrance from the rest of the Acropolis. It is the oldest of the three architectural complexes which are on the southern slopes of the Acropolis. The Greek tragedies of Euripides and Sophocles were performed here and the Stoa of the Eumenes built by King Eumenes II is located nearby. The Acropolis is Athen's most renowned attraction and people from all over the world visit it annually. Getting to the Acropolis is quite easy. The Museum encourages visitors to use one of the several means of public transporation that serve the Museum (see above) and to avoid using their cars in the historic quarter of Athens. 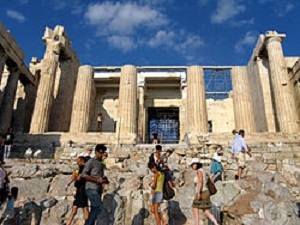 Disabled access to the Acropolis is provided by a wheelchair stair climber lift and an elevator. The ground is very even but there are a few steps once you get up there. If you are in a wheelchair or have a disability, you should take a taxi up to the entrance of the Acropolis. Tickets are sold at the two gates near the Acropolis. If you use the metro, the ticket kiosk is across from the Acropolis Museum. 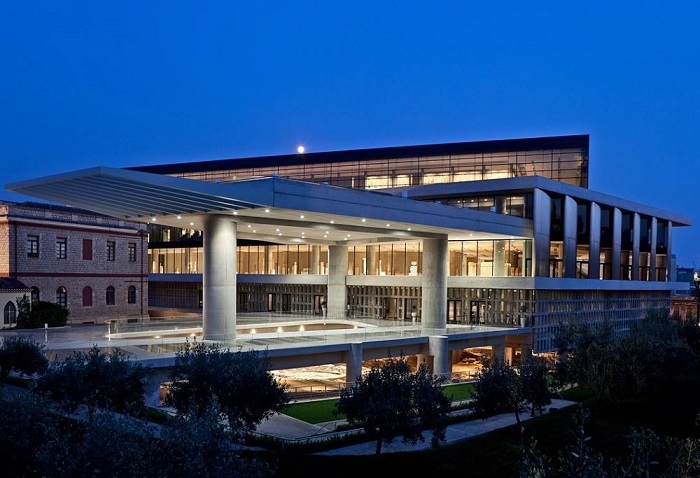 On Good Friday, the Acropolis Museum opens from 12 noon to 6 p.m. and on Easter Saturday, from 8 a.m. to 3 p.m.
On Christmas Eve and New Year's Eve (24 and 31 December), the Acropolis Museum opens from 9 a.m. to 3 p.m. The Acropolis is a historical site which simply can't be missed, especially for people who love architecture, art, and history. A lot of people are anxious when they finally get there, and they ask if it will be as beautiful as the photographs. Some also wonder if it will be a disappointment. Rest assured that the Acropolis is a destination which does not disappoint but it can be infuriatingly crowded. What you need is ample time to watch the columns of the Parthenon appear and change colors, time to stand on the Belvedere and take in the views over Athens and listen and observe the crowd. When you climb the hill, you are well on your way to see the most famous temple in Greece. People lived in the Acropolis as early as 5000 BC. The Acropolis is massive, and its sheer size made it an excellent natural defense. During classical times, when the population of Athens was around a quarter of a million, it was the city's business and civic center. There is so much to discover in the museum and a tour through the museum is a lesson in history, culture, and art. Turks seized the Acropolis in 1458 and after two years they adapted the Parthenon tas a mosque. There was no substantial material change, the only thing they did was raise a minaret at the southwest corner. The Acropolis was destroyed in 1687 during a siege of Venetian forces. During the bombardment, a powder magazine situated in the temple blew up, destroying the building's center. The Parthenon was damaged, but the artifacts were still intact until 1801 when Lord Elgin negotiated a deal with the Ottomans. Elgin removed the marbles and now the majority of sculptures from the frieze are in the British Museum in London. The Greeks only regained control of the Acropolis in 1822, during the Greek War of Independence. The Acropolis is visited by millions of people every year, eager to lay their eyes on one of the most important treasures of ancient Greece. It is important to plan your visit so that you do not waste your time and money and you can make the most of your visit to the Acropolis. Summer months can be too hot to visit the Acropolis and there are so many visitors so if you do not like the heat and you want to avoid the crowd, then opt for off-peak season. You will have a much more pleasant experience if you do not go during summer. The best time to visit is before 9 am as the crowd swells to an uncomfortable level after 10 am. An afternoon visit is also a good idea; however, you need to remember that guards begin herding people towards the exit at least 90 minutes before closing time. Spend at least 45 minutes to examine the monuments comfortably. The Acropolis is a very popular destination, so crowds and long lines are expected. If you are going to be in Athens for a long time, then you can opt to purchase tickets at the gate. However, if you have limited time it is best to purchase tickets in advance and opt for skip-the-line tickets so you can get access instantly. Wear sturdy and comfortable shoes, hat, sunglasses, sunscreen, and light and airy clothes when going there during summer. Remember to take a bottle of water to hydrate yourself. If you are sensitive to the sun, you might want to bring a parasol along as the site does not have much shade and the summer sun is quite intense after mid-morning. Buy water before you reach the ticket concourse since the vending machines inside are often out of order and when they do work, the queue can be very long. Save yourself some time by buying a bottle of water before entering the premises. Large bags and coats have to checked at the building near the entrance, to the left of the ticket course. One of the most common mistakes people make when traveling is inadequate research and planning. Most of the time people are too busy to look at deals available to them and often spend more money than they should. If you are on your way to Athens and Acropolis is on your must-visit list, you are in luck. We have scoured the Internet for you to give you the best deals possible. Aside from paid attractions, there are also plenty of free things to do in Athens. Athens attractions tickets are widely available and can also be purchased online, just like the deals we have rounded up on the table below. 2. Acropolis Museum Tour & Skip the line Tickets What is it? The Acropolis is a testament to man's intelligence, creativity and artistry. It celebrates not only the evolution of Greek civilization, but of man himself. Being in Athens is an opportunity to explore the site, as well as other notable tourist attractions. 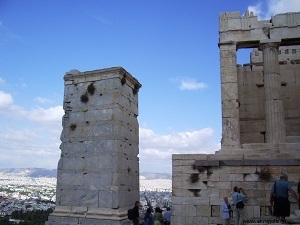 Make good use of Athens day trips and Athens city pass to point you in the right direction. Hop On Hop Off Athens also gives you the chance to explore the city for less, at your own pace. Whatever option you choose, you will certainly have a lovely time in Athens.